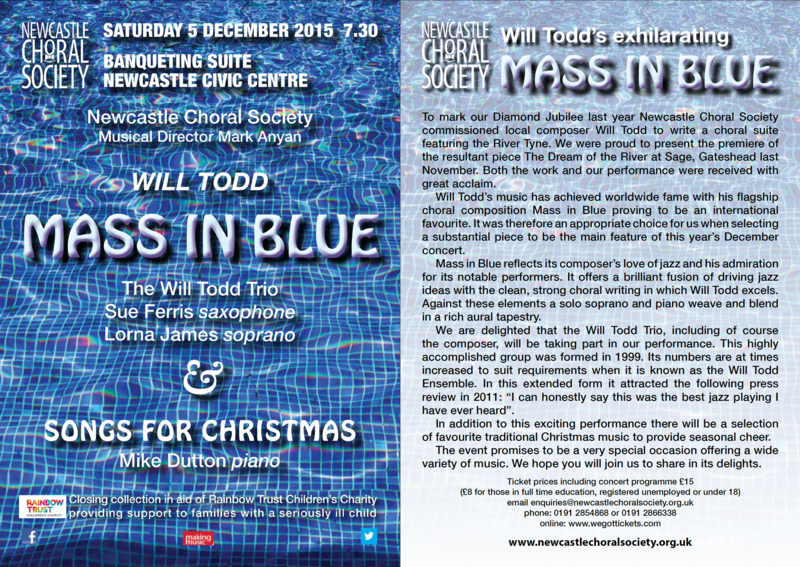 Our concert on 5 December 2015 was held in the Banqueting Suite of Newcastle Civic Centre. The main feature was Mass in Blue, by local composer Will Todd. We were delighted that the Will Todd Trio, including of course the composer, took part in our performance. The Trio was really fantastic, as was Sue Ferris playing saxophone. Soprano soloist Lorna James was absolutely fabulous. 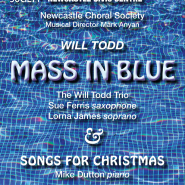 In addition to the exciting Mass in Blue performance, there was a selection of favourite traditional Christmas music to provide seasonal cheer, and we were pleased to be accompanied by the great Mike Dutton on piano. The choir thoroughly enjoyed the evening, and hope the audience did too! We held a closing collection in aid of the Rainbow Trust Children’s Charity, which provides support to families with a seriously ill child. Will Todd is very close to this charity, and he spoke about its work at the concert. 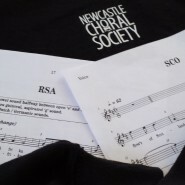 Newcastle Choral Society tackles the Anthems! Newcastle Choral Society is currently singing to the choir’s largest ever audience – at Rugby World Cup 2015. The choir was appointed to lead the singing of the national anthems at all three Rugby World Cup 2015 matches being held in October at St James Park, Newcastle, following a chance approach from Progress Productions, the Sports Presentation partner to England Rugby 2015. This presented the choir with the unusual opportunity of singing to an audience of more than 50,000 people in the stadium – and many millions watching the matches around the world. Two more matches to come! More dialects and language to polish up – no music allowed on the field! This Friday 9th October we will sing the New Zealand and Tongan anthems at the match which starts at 20.00 and on Saturday 10th October, with Samoa and Scotland kicking off at 14.30. The Choir in Print! We also featured in the Newcastle Evening Chronicle on 7 October. Read the article, see the photographs and enjoy viewing some video HERE!